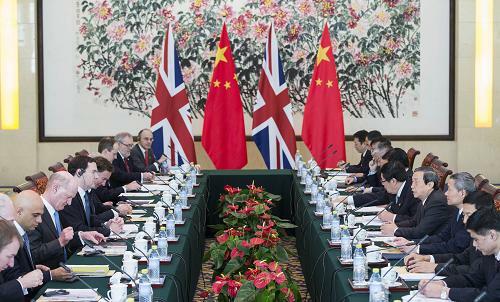 Beijing, October 15 (XINHUANET, Reporters: Yang Yijun and Hou Lijun)-The fifth China-UK Economic and Financial Dialogue was held in Beijing on October 15. Chinese Vice Premier Ma Kai and British Chancellor of the Exchequer George Osborne co-chaired the dialogue. Centering on the theme of “working together to promote a forward-looking, mutually beneficial and growth-oriented China-UK economic and financial relationship”, the two sides conducted candid and pragmatic discussions on macro-economy, trade, investment, finance and other topics and attained substantial results. Ma Kai said that, facing the current complicated global economic situation, China and the UK should, based on the pragmatic and balanced principles of mutual respect, produce new highlights in economic cooperation, deepen financial cooperation, strengthen coordination of major international economic and financial affairs and jointly promote continued and healthy economic growth. China appreciates the UK’s promise to provide convenience to work permit applications, customs clearance of equipment and materials and other preferential taxation policies for Chinese enterprises that invest in British infrastructures. The two sides should continue to make good use of the platform of the China-UK Economic and Financial Dialogue to facilitate the healthy development of China-UK relations and bring benefits to the peoples of both countries. Osborne said that the UK appreciates the steadfast determination and pragmatic measures taken by the new Chinese government in deepening reforms and continuously opening up to the outside world, and will join hands with China to strengthen international economic policy coordination and cooperation in the G20 and other multilateral mechanisms and take a joint stance against all forms of trade protectionism. China and the UK reached 59 mutually beneficial and win-win agreements, and the two sides will engage in cooperation in fields such as civilian nuclear energy, advanced materials, the photovoltaic industry, hi-tech and service sectors. China appreciates the UK’s reiteration of its support for the EU to recognise China’s full market economy status at the earliest date, UK’s promotion and facilitation of trade among civilian end users and in civilian end-user hi-tech with China, and the agreement on allowing Chinese-funded banks to establish branches in the UK. The UK looks forward to the day when China hosts the G20 summit. After the Dialogue, Vice Premier Ma Kai and Chancellor Osborne attended the signing ceremony of the Memorandum of Understanding on the Strengthening of Civilian Nuclear Cooperation between the two governments and held a joint press conference. On 14 October, Vice Premier Ma Kai and Chancellor Osborne had an informal discussion with entrepreneurs from China and the UK.